At E&I, we believe in the power of knowledge, and that means ensuring our members have the information they need, to address their most pressing challenges. That’s why we’ve provided you with professional industry Insights from our team experts as easy-to-download and print-friendly materials. Where should procurement leaders set their sights to ensure growth and success? 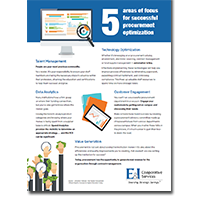 From technology automation to data analytics and talent management, dive into 5 key areas that will guide your path to successful procurement optimization. 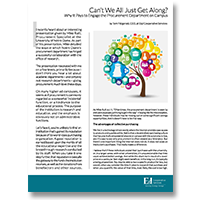 E&I’s newly enhanced Grainger contract represents the most competitive value for any educational institution. 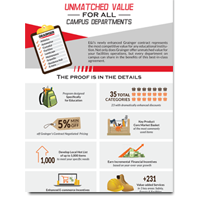 Not only does Grainger offer unmatched value for your facilities operations, but every department on campus can share in the benefits of this best-in-class agreement. Nationwide, higher education enrollment numbers have been on a steady decline. 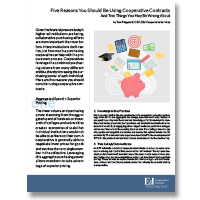 As institutions struggle to recruit new students and keep tuition increases down, procurement plays a critical role in increasing efficiencies. Check out this infographic to see how. 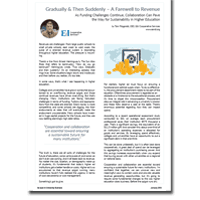 Today’s higher ed institutions continue to battle enormous financial challenges, strained resources, and persistent negative perceptions. 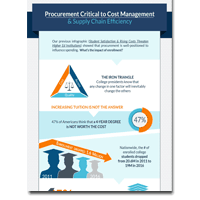 This infographic illustrates how procurement is well-positioned to have a profound impact on controlling spend and improving the financial sustainability of an institution. Higher education institutions across the board are facing extraordinary challenges in terms of funding. 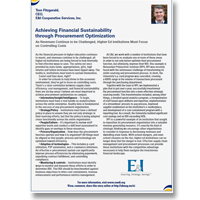 In this article, Tom Fitzgerald, CEO of E&I, discusses the importance of cost stewardship, supply chain management, and collaboration when it comes to achieving financial sustainability in these trying times. Like any scientific venture, major decisions—especially financial—require thorough research, planning, and strategy for successful implementation. 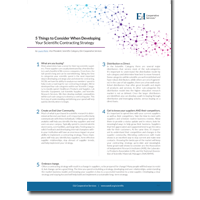 Before you begin developing a contracting strategy for your scientific purchases, consider these key points recommended by Laura Perin, Vice President of E&I’s Scientific Category. I recently heard about an interesting presentation given by Mike Rulli, Procurement Specialist at the University of Notre Dame. As part of his presentation, Mike detailed the ways in which Notre Dame’s procurement department has forged a successful collaboration with the office of research. 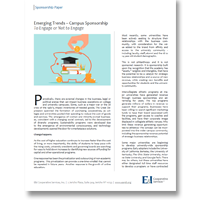 Periodically, there are external changes in the business, legal or political arenas that can impact business operations on college and university campuses. Some, such as a major war or the oil crisis of the 1980’s, impact inventories of needed goods.